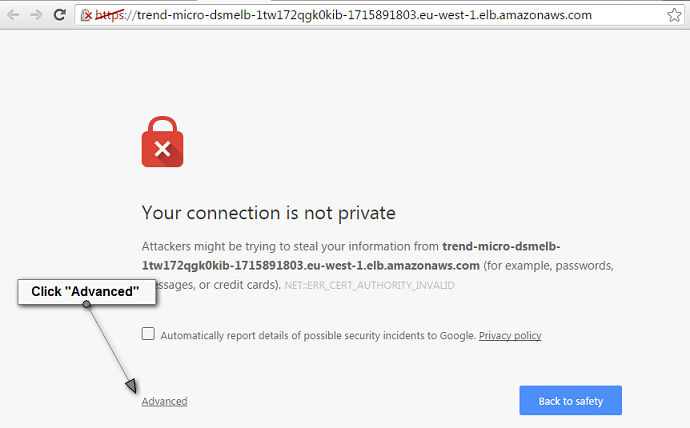 The Elastic Load Balancing (ELB) load balancer used by the Deep Security Manager is initially configured to use a self-signed certificate for HTTPS connections. Your browser may give you an error when you try to access the console. This is expected until you update the load balancer certificate. You can proceed through to the management console. Using security groups to restrict traffic to only what’s needed. Deploying a Deep Security Agent on the manager instance to protect it from attack. Using the robust role-based access controls available within the platform to ensure that only valid users have access to the platform. The Deep Security Manager is initially configured to use a public load balancer so it can easily protect instances in AWS Regions and AWS accounts outside where it’s deployed. If you do not require this functionality and do not require the Deep Security Manager console to be accessible from the internet, we recommend that you reconfigure the Deep Security Manager to use a private load balancer to further reduce the attack surface. You can also set up VPC peering if you’d like to use a private load balancer and still protect instances outside the VPC where the Deep Security Manager is deployed. If you are using the Quick Start as the basis of a production deployment and not as a proof of concept, we strongly recommend that you update the self-signed certificate to a certificate that is signed by a trusted Certificate Authority. In order to obtain a signed certificate, you will be required by the Certificate Authority to specify a formal subdomain (for example, deepsecurityconsole.mycompany.com) and use this to access the Deep Security load balancer. 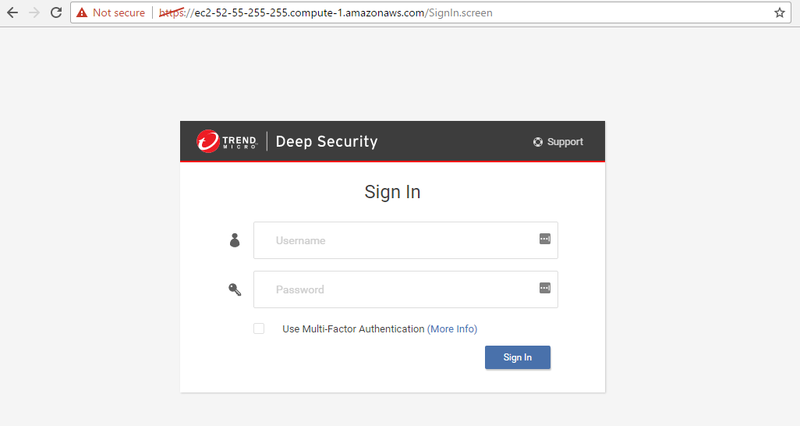 Register a domain name that you will use to access the Deep Security Manager console. Obtain a certificate for this domain from a trusted Certificate Authority. Add the certificate to your certificate store. Instructions on how to do this can be found in the Identity and Access Management documentation. Update the DNS settings of the load balancer to use the new domain name. Detailed instructions on how to do that can be found in the Elastic Load Balancing documentation. 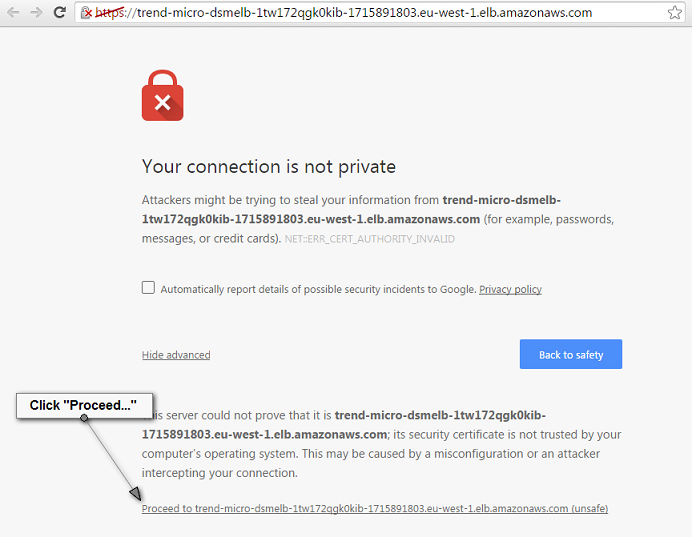 Replace the SSL certificate of the load balancer. Detailed instructions on how to do that can be found in the Elastic Load Balancing documentation.